But I didn’t know exactly how to make it until Kanika posted the recipe in 2013. Since then I’ve adapted her recipe and have made it several times, mostly when guests were visiting for a dip with crudités. I’ve almost always made hummus with white chickpeas until Kanika suggested they can be made with any sort of beans. She recently tried making them black chickpeas and I followed suit. It was delicious. I even tried a cilantro version with it once after I googled if cilantro was good idea in Hummus. I was not disappointed when I discovered a recipe on Jamie Oliver’s website for Cilantro and lime Hummus. Kanika has been even more adventurous and has recently made a Black Gram with Roasted Mushroom Hummus that makes my mouth water just as I write this! Give it a shot and tell us how it was. That’s the beautiful thing about Hummus. 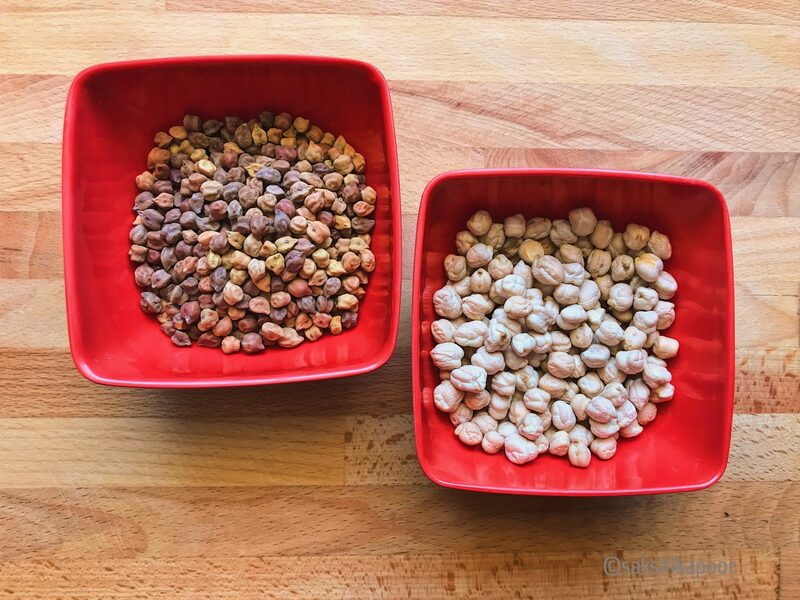 You can make Hummus with any kind of beans or legumes and add any flavour to it! The worldwide popularity of Hummus in recent times is just an example of how there is no such thing as “Traditional food”! And I don’t mean that in a bad way! I mean that once a recipe or a particular food travels, people adapt it according to their taste and flavours and make something new and beautiful. Most migrants bring in their food culture to the country they live in and make do with whatever ingredients are available and make something entirely new. Like the Persian Biryani has transformed into so many different kinds in India and Pakistan alone! Now of course with the internet, food blogs thrive and spread knowledge of all kinds of food to their audience. Food like culture evolves over time! The result is that everyone is eating newer kinds of food! Now back to the Hummus after the unwarranted philosophising! The idea for Beetroot in Hummus came from reading about it on a restaurant menu. I wanted to try it but wasn’t sure if I would like it. I had to make it on my own! That’s because I’ve had a love hate relationship with Beetroot while growing up. My mother often made a Beetroot and Green peas sabzi that I wasn’t ever fond of. I didn’t mind beetroot if it was shredded finely and added to a salad though. And then my mother and father would have their own debates about how they liked it cooked or uncooked in salads. They confused me further about the vegetable and I never fully got to appreciate it until I started making a Beetroot Thoran (beetroot and Coconut Stir fry with South Indian flavours) with it a few years ago! I usually make a spicy version of hummus. Maybe it’s the Indian in me, but I definitely think that adding an extra green chilli and some red chilli powder gives the Hummus a nice kick and lifts the flavours. You can make it without the chilli as well depending on how you like it! I don’t use canned beans as I always keep a stock of beans and dals in my pantry and also because of a general distrust of canned foods. I prefer to make it from scratch. Transfer the soaked chickpeas and water in a pressure cooker and add salt. I added 1 and a half teaspoon of salt for the 1 cup of chickpeas I used. This, of course, is according to your taste. Put the lid on and pressure cook for 3-4 whistles. Let the pressure release on its own from the cooker and take out the chickpeas from the cooker. Reserve some liquid for processing later. How to cook the beets? Meanwhile, cook the beetroot in whichever way you prefer. It can be baked, steamed or boiled. I steamed it in a microwave by peeling it first, slicing it into thin slices and then cooking it for approximately 2-3 minutes with a sprinkle of water. In a blender, mixie or processor (whatever you use! 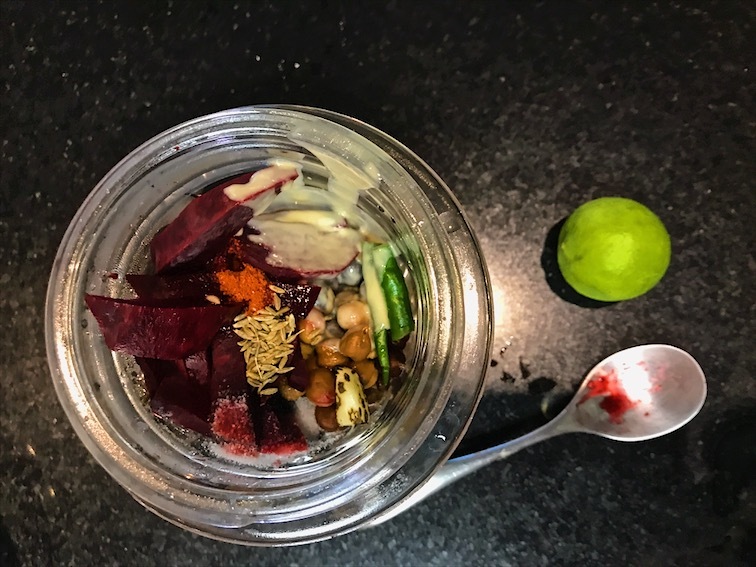 ), add the boiled chickpeas, Tahini paste, cooked beetroot, peeled cloves of garlic, green chilli, cumin seeds, juice of half a lime and tiny bit of red chilli powder. Add a few teaspoons of chickpea water or Aquafaba as the experimenetal food community calls it! Drizzle some Extra Virgin Olive oil, about a tablespoon and process all the ingredients. Process/Blend till it reaches a creamy consistency. You can add more chickpea water if you feel the ingredients are not processed properly. The liquid helps to make the ingredients move around smoothly in the processor. Once the hummus reaches a creamy scoop-able consistency, take it out in a bowl and drizzle some olive oil on it. Enjoy with crudités, pita bread, on a toast or with crisps! I’ve even had it with a plain dosa! It tastes delicious! The prettiest pink Beetroot Hummus is ready to serve with some pita chips! 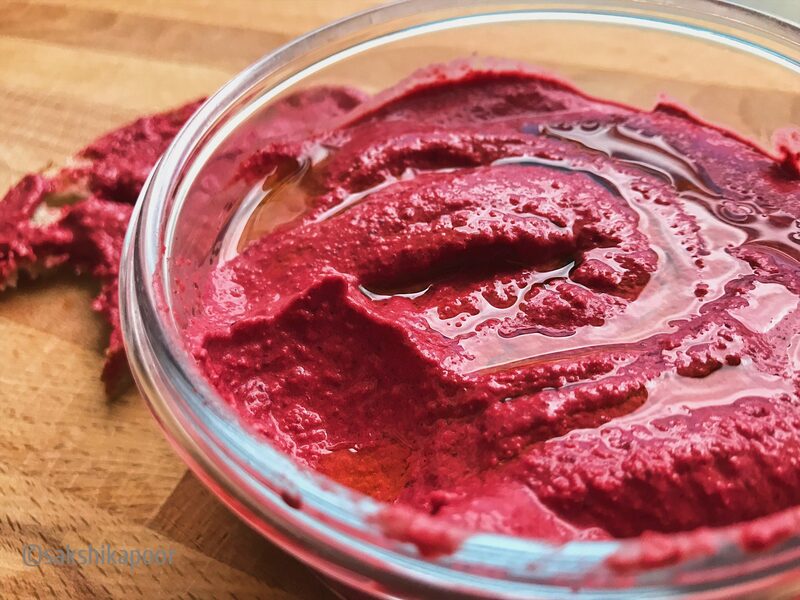 A pretty and flavourful Hummus made with Beetroot and Black chickpeas. Soak the chickpeas overnight in water enough to cover them. If you're short on time, you can use canned chickpeas. Or if you're using dry chickpeas, black or Garbanzo ones, you'll have to soak them for at least 4-5 hours. Transfer the soaked chickpeas and water in a pressure cooker and add salt. I added 1 and a half teaspoon of salt for the 1 cup of chickpeas I used. Put the lid on and pressure cook for 3-4 whistles. Let the pressure release on its own from the cooker and take out the chickpeas from the cooker. Reserve some liquid for processing later. In a blender, mixie or processor, add the boiled chickpeas, Tahini paste, cooked beetroot, peeled cloves of garlic, green chilli, cumin seeds, juice of half a lime and tiny bit of red chilli powder. Add a few teaspoons of chickpea water (Aquafaba). Drizzle some Extra Virgin Olive oil, about a tablespoon and process all the ingredients. Once the hummus reaches a creamy scoop-able consistency, take it out in a bowl and drizzle some olive oil on it. Enjoy with crudités, pita bread, on a toast or with crisps! 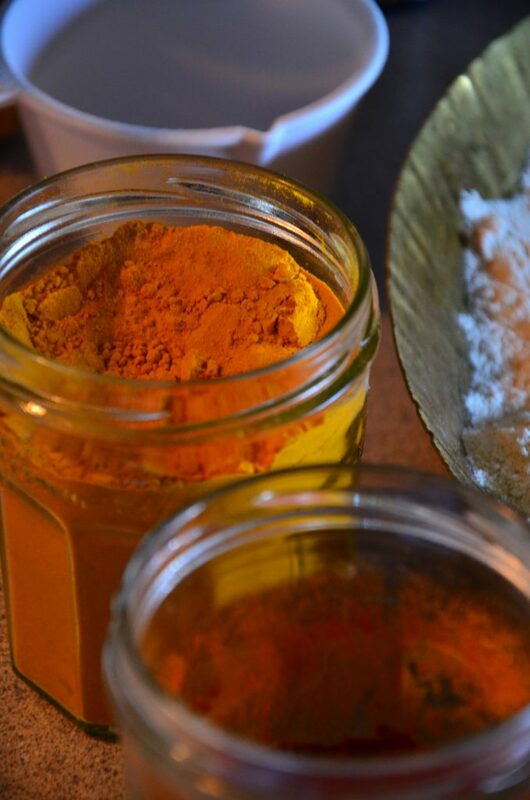 Some people suggest using baking soda while cooking un-soaked chickpeas but from an Indian point of view, we generally avoid it and prefer using more natural methods. Good food takes time! Don't hurry the process! All beautiful, all fabulous recipes.